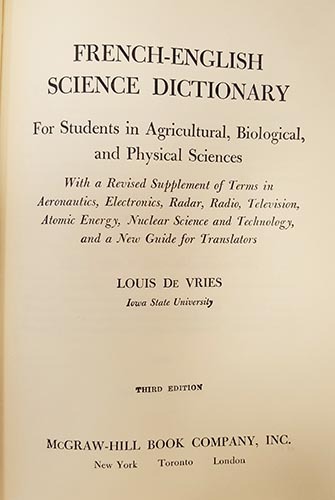 …of the science dictionary. I picked up a French-English science dictionary that a colleague gave me after a clean-up. She knew I had a scattering of French to add interest to the years of science language and veterinary terminology, and correctly assumed I’d be interested. Thus started a pleasant half hour of page-flipping to find such fun words as goutte-de-sang (pheasant’s eye – literally ‘drop of blood’), goupillon (test-tube brush or Aspergillus!) and gracilifolié (with slender leaves). Well, it was more a case of flipping open the dictionary at the gr- pages. It’s tempting to spend another half-hour right now browsing another page, but that will have to wait. I’ll just have a quick few words about goupillon. I was intrigued to find that one of its meanings was Aspergillus. Those of you (if anyone is reading!) who know a bit of microbiology will know that this is a fungus. Aspergillus mould is the black sooty patchy stuff that grows on bread or onions or walls. Why would a word that means ‘bottle brush’ also mean a genus of mould? I had a think about what I know of fungi. They have a fruiting body on the end of a stalk that releases spores. If you google ‘aspergillus’ images you’ll see pictures of lovely bristly mops on top of long stalks. These look like bottle brushes! So there we have it. I don’t suppose the compiler of this old dictionary intended his work to be flipped through as a bit of idle amusement. But how wonderful that we have such lists to remind us of how words are composed (goutte-de-sang!)! Even without any foreign language knowledge, it is fun to look at words, especially those of the science word, and speculate about what they might mean. Why not go down your own rabbit-hole. You might be led on a little adventure – maybe not of the chaotic Alice type, but hopefully with some fun.